Halloween is fun time for kids with silly carved jack-o-lanterns, costumes, and sugar laden yummy treats. The season makes a big impression on kids, but it does not have to affect their teeth. By following sensible guidelines about Halloween candy, parents and kids can relax and enjoy sweet treats without feeling tricked and terrified by lurking sugar monsters. 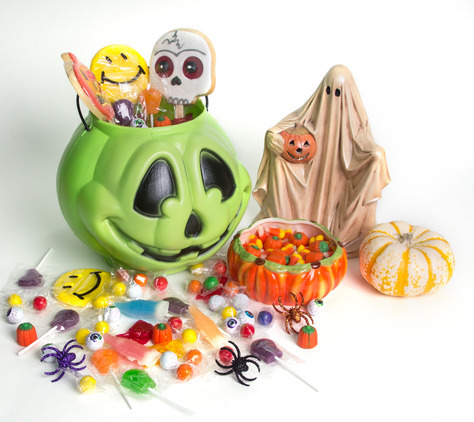 Set candy limits with kids before Halloween. If kids understand boundaries ahead of time, they are more accepting. Serve sweets with a cool drink of water and foods like a cheese stick to help neutralize sugars. Sort treats and create a family candy cache. It is good to check candy and eliminate anything that is open or questionable. Sticky candies, jawbreakers, and sugared bubble gum ought to be discarded. Make a plan with kids to take special care of their teeth after eating sweets by brushing and flossing soon after eating candy. The longer sugar is present on teeth the more damage it causes. Sugar creates a breeding ground for acids and bacteria. Offer kids sugar-free chewing gum made with xylitol after eating candy if their toothbrush is not nearby. Gum works to create more saliva in the mouth that helps neutralize the acids and bacteria that feed off the sugar. Use fluoridated toothpaste and oral rinses after eating sugary treats. Fluoride helps to strengthen teeth against decay. A regular cleaning at the dentist’s office along with fluoride treatments twice a year helps reduce decay of healthy teeth. Seek sugar-free alternatives to giving Halloween candy. Think inexpensive novelty toys or gadgets. A coupon to a game site is another option. Visit StopZombieMouth.com to download the free Plants vs. Zombies™ game. Have family fun with tricks and treats this Halloween. Make it a great time to talk with kids about oral hygiene and brushing up on their mouth cleaning skills. Make appointments with the dentist’s office for check-ups and cleanings. To request an appointment online, click the Schedule An Appointment button above.